Over the course of a career that stretched from the 1920s to the 1980s, Alice Neel painted portraits of hundreds of friends, family members, lovers, artists art historians, writers, and political activists, believing that “people are the greatest and profoundest key to an era.” Seeking to express psychology above absolute physical likeness, she often used exaggerated colors and expressive brushstrokes and eliminated extraneous details in order to capture the inner lives of her subjects. Neel was a longtime supporter of leftist causes. In the painting of Pat Whalen (1935), she depicts the Communist activist and union organizer for the longshoremen of Baltimore as a paragon of social justice. 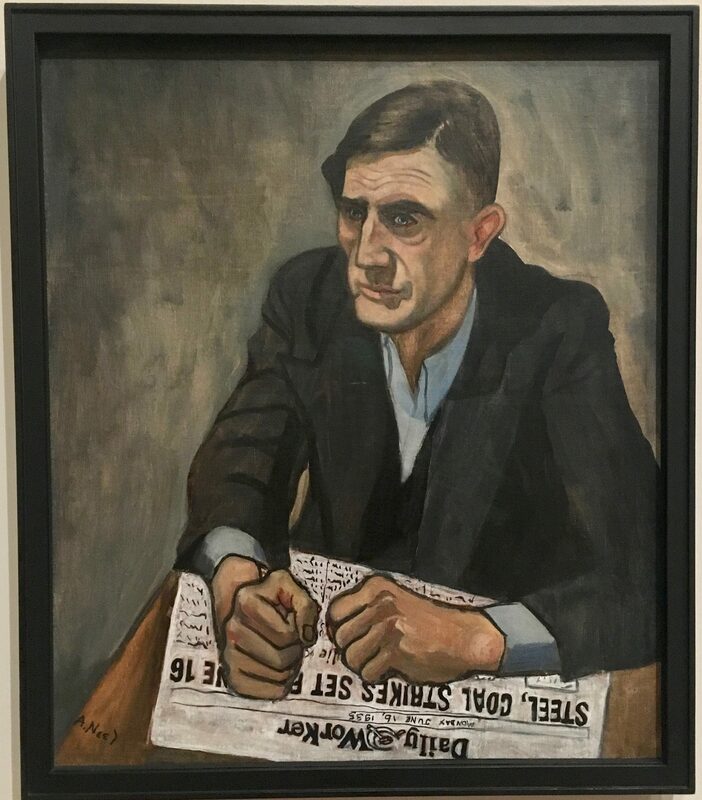 Whalen’s creased face and expression — along with a copy of the Daily Worker, the official newspaper of the Communist Party USA, resting beneath his large, clenched — suggest both a noble archetype of the blue-collar worker and an all-consuming commitment to the working man’s cause. German painter Otto Dix portrayed his subjects with a hard-edged, detached realism, accentuating unattractive features and signs of age. 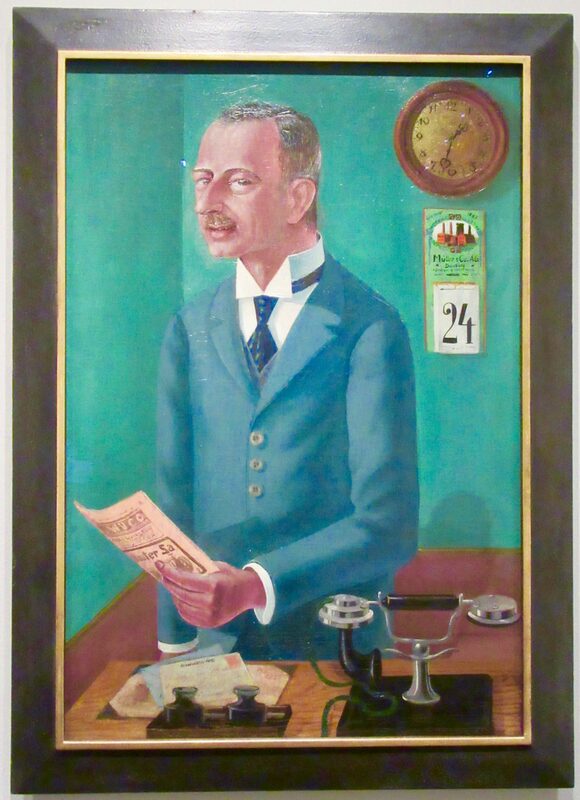 Since this portarit, The Businessman Max Roesberg, Dresden (1922) was a commission, his treatment of his subject was rather kind. Dix highlights Roesberg’s business prowess — which was short-lived — in several ways. The room is cluttered with materials central to a productive professional practice, such as a telephone, calendar, and tools for correspondence,while the palette of greens and blues alludes to rh coorof money. Moreover, Roesberg’s body is almost completely obscured by his business suit — a mark of his professional identity. A powerful rendering by the artist in her twenties, this picture was made with a practical purpose; it was painted as a reception piece for admission to the life-drawing course at the National Academy of Design. 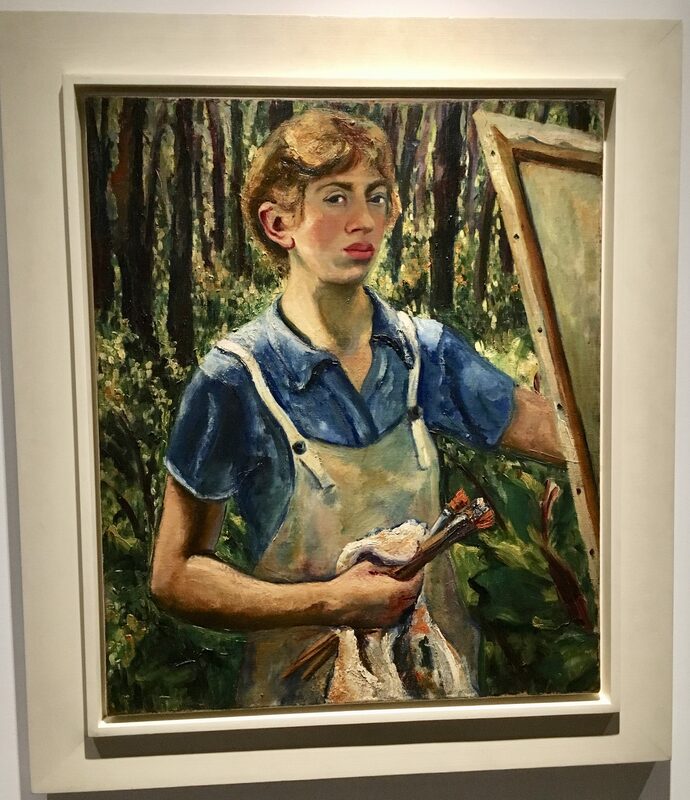 While Lee Krasner (1908 – 1984) is best known for the personal style that she developed within the movement of Abstract Expressionism in the 19540s, this self portrait (c. 1930) is a rare example of her early work, using the thick brushwork and high color of the Impressionists and Realists of the previous generation. Strikingly, Krasner depicts herself at work in nature. She eyes the viewer, who stands on the spot where, presumably, a mirror hangs on a tree. Her expression and strong handling of light and shade evoke the resolve of a young woman rising to the challenge of her artistic vocation. This emphasis on the nose recurs throughout Modigliani’s work and is a focal point of his sculpture. It is s self-referential facet of his own Jewishness — an identity that his daughter later recalled as being deeply important to him. Modigliani’s exploration of his Jewish identity, as a central aspect of his portraiture, has been little noticed. 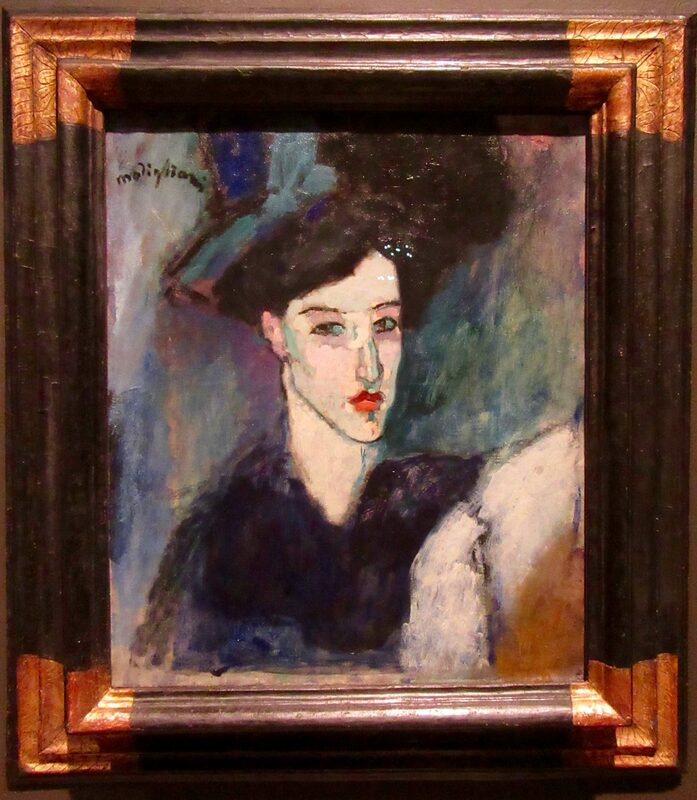 Photographed in the Jewish Museum in NYC as part of the Exhibit Modigliani Unmasked, which Continues Through February 4th, 2018. 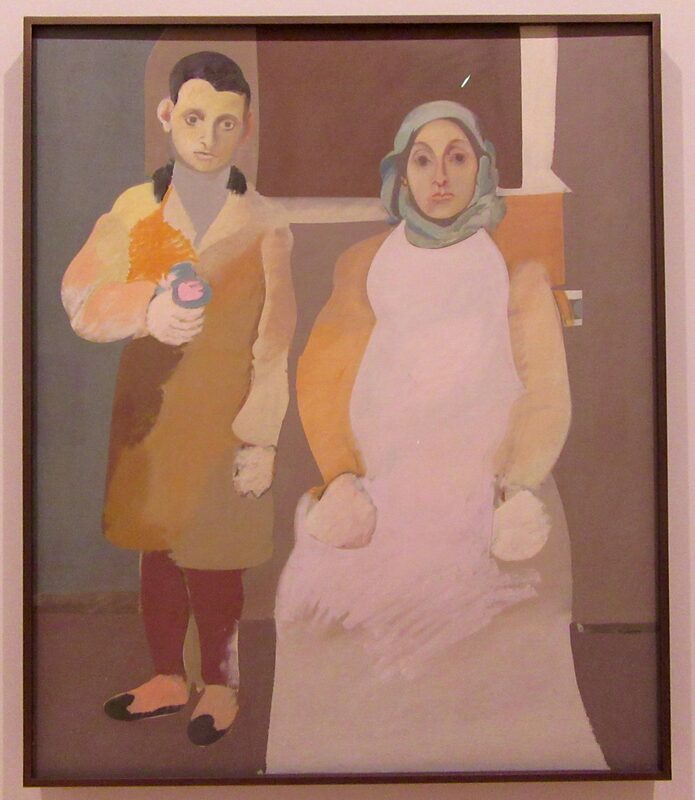 Arshile Gorky (1904 – 1948) based this portrait of himself and his mother on a photograph taken in his native Armenia in 1912, when he was eight years old. Three years later, during the Ottoman Turk campaign of ethnic cleansing against the Armenians, Gorky, his mother and his younger sister all survived a death march. Tragically, his mother never recovered her health. She died in 1919 from starvation — one of the estimated one million to one and a half million victims of what is now widely referred to as the Armenian genocide. The following year, at the age of fifteen Gorky emigrated to the United States with his sister. As Gorky established his career as an artist, he became preoccupied with the photograph. The Artist and His Mother, made over the span of ten years (1926 – 1936) does not attempt to reproduce the camera’s image precisely, but instead reduces it to broad areas of muted, softly brushed color. The mask-like faces and undefined hands of the figures at once suggest their loss of physical connection and the difficulty of accessing memories over time. 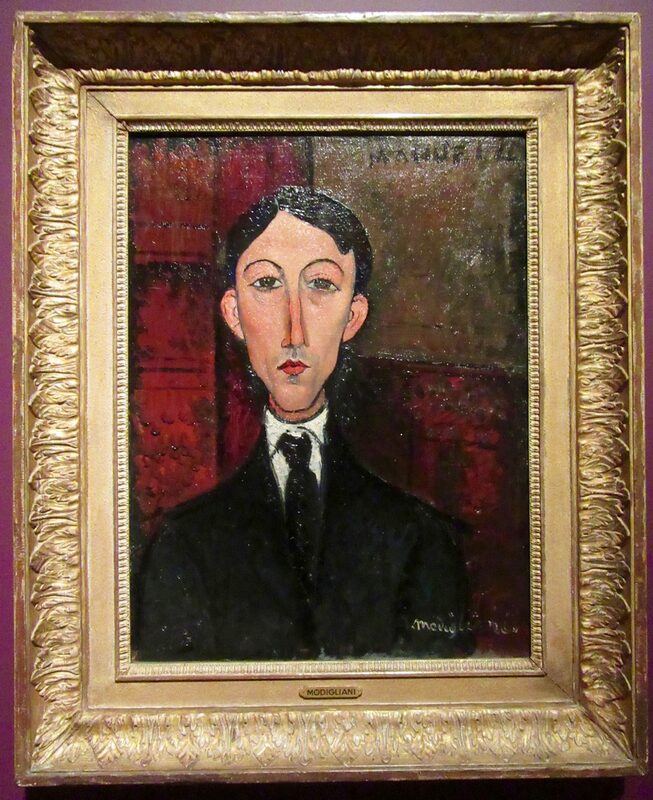 Amedeo Modigliani (1884 – 1920) immortalized the Spanish landscape painter Manuel Humbert Esteve, a struggling artist whom he met in the ethnically diverse environment of Mantparnasse, in Portrait of Manuel Humbert (1916). In such paintings, he continued to question portraiture’s claim to truth, presenting the genre as ever-ambiguous. Here, he renders the sitter’s head as mask-like, with a narrow, triangular face and stylized arched brows connected to a thin. straight nose. He distinguishes personal features as well — pursed mouth, parted hair — constantly altering the counterpoise of individuality and formal abstraction. 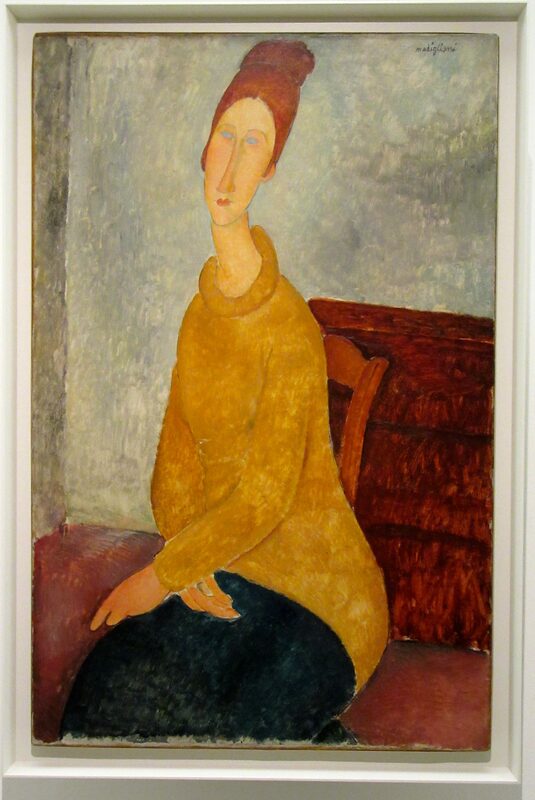 Amedeo Modigliani (1884 – 1920) met Jeanne Hébuterne in 1917, when she was 19 and a student in Paris. That same year, they moved into a studio and remained together until their deaths in 1920 (Hébuterne committed suicide the day after Modigliani died of tuberculosis). Hébuterne was the subject of more than 20 portraits that embody the artist’s signature depiction: a dramatically elongated figure with almond-shaped eyes and sensual but firmly closed lips. Hébuterne looks straight ahead, but her eyes are empty, as if caught in a reverie. African masks and early Sienese masters, as well as the concurrent styles of Constantin Brancusi and Pablo Picasso, influenced Modigliani’s work. Jeanne Hébuterne with Yellow Sweater (1919) was photographed as part of the exhibit, Visionaries: Creating a Modern Guggenheim in the Solomon R. Guggenheim Museum in NYC.